IFC's comic deconstruction of documentary filmmaking is the field's foremost outlier—which is why the TV Academy would do well to honor it. Spliced together from interviews, establishing shots, and dramatic reenactments, its subjects’ homegrown aphorisms set against the forceful tinkling of the score, “The Eye Doesn’t Lie” might’ve been made by Errol Morris himself. Inspired by “The Thin Blue Line,” the fourth episode of IFC’s inventive, erudite “Documentary Now!” — from the frenzied imaginations of director Rhys Thomas and “Saturday Night Live” alumni Fred Armisen, Bill Hader, and Seth Meyers — mimics the filmmaker’s work so precisely that it comes to resemble an X-ray, showing the bone structure of his distinctive style while (gently) poking fun at it. In this sense, to describe “Documentary Now!” as a parody is to undersell: It’s a wildly funny act of criticism, deconstructing the mechanics of nonfiction in an age defined by the slippage between “reality” and the real. 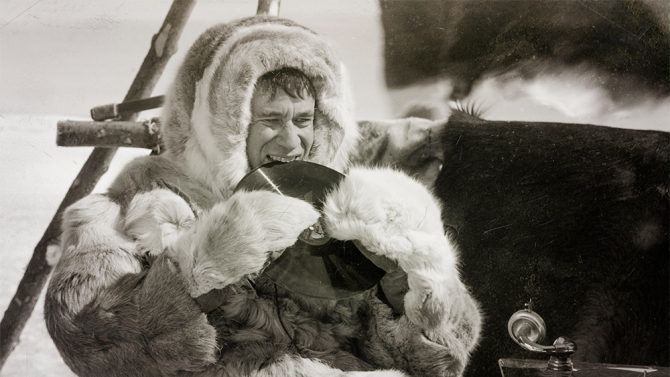 Understanding documentaries as a set of narrative techniques, and not simply as a reflection of “the facts,” “Documentary Now!” is at its most astute in the first season’s “Kunuk Uncovered.” Based on 1988’s “Nanook Revisited,” itself an investigation of the stagecraft in Robert Flaherty’s 1922 silent, “Nanook of the North,” “Kunuk” renders explicit the series’ animating principle: “Was the first documentary a documentary at all,” the narrator intones, “or was it something else?” As William H. Sebastian (John Slattery) attempts to mold his subject, Pipilok (Armisen), into the “Eskimo” of his ethnocentric assumptions, mounting dog sledding and spear fishing scenes, he loses control of the project to its central figure. “Kunuk” becomes an artful farce, part Hollywood excess and part careful craft. Pipilok first demands compensation, securing the managerial services of a local pimp, and then displaces Sebastian altogether, transforming into a tortured auteur. (At one point, he curses out the cast in his native tongue, a true diva of the directing chair.) His aesthetic innovations — recording sound, building sets, developing “point of view” and new forms of movement — are those, roughly speaking, of realism, and “Kunuk” is, in essence, a reminder that the style that doesn’t seem like a style is no less fabricated for convincing us otherwise. In “Documentary Now!” nonfiction is always “something else”: A performance, a manipulation, a construction, adjacent to “the real” but not a mirror image of it. In fashioning a new short film for each installment—with the exception of the two-part “Gentle and Soft: The Story of the Blue Jean Committee” — the series is an outlier in the Emmys’ nascent Variety Sketch category. Last year’s inaugural field featured five nominees on the traditional “sketch” model, including “Saturday Night Live” and winner “Inside Amy Schumer,” and all, including the final season of the excellent “Key & Peele,” are among this year’s twenty eligible series (up from 17). But given the TV Academy’s tendency to settle into firm patterns, to the point that one might call them ruts, it would behoove voters to honor the heterodox, learned, distinctly non-topical comedy of “Documentary Now!” while the contours of the category are still in flux. If there’s one aspect of the series we know Academy members can appreciate, it’s the brilliant impression: Schumer and Ryan McFaul were nominated last year for directing the dead solid perfect satire “12 Angry Men Inside Amy Schumer” as if inhabited by the spirit of Sidney Lumet, a feat “Documentary Now!” manages many times over, and in myriad registers. Its sketches succeed, in the end, because they’re not sketchy at all, but rather fully realized, remarkably savvy reconsiderations of their subject, which is the creative, sometimes-deceptive act of documentary filmmaking itself. “The Eye Doesn’t Lie” recalls not only “The Thin Blue Line,” then, but also, by dint of its title, the filmmaker’s examination of visible evidence in “Standard Operating Procedure.” “The pictures spoke a thousand words,” as Army Special Agent Brent Pack says in the latter of photographs of prisoner abuse at Abu Ghraib, launching into the kind of Morris-esque paradox that IFC’s series so beautifully distills. “But unless you know what day and time they were taken, you wouldn’t know what story they were telling.” The eye does lie, of course, and the brilliant “Documentary Now!” is always catching it red-handed.